This is the sixth year of our folk music, dance and song summer school – for all ages and abilities – led by a crack team of tutors who have detailed knowledge and extensive experience of a wide spectrum of folk music. There will be groups for dance (Kerry), song (Carolyn), fiddle (Sophy), accordion (Paul), guitar (Kevin) and mixed-instrument (Jo), but the programme will be fluid enough for you to move from group to group should you wish. The week leads towards a full-group piece, allowing you to learn about how to structure a performance, work together, use all levels of skills – and create something that’s amazing! 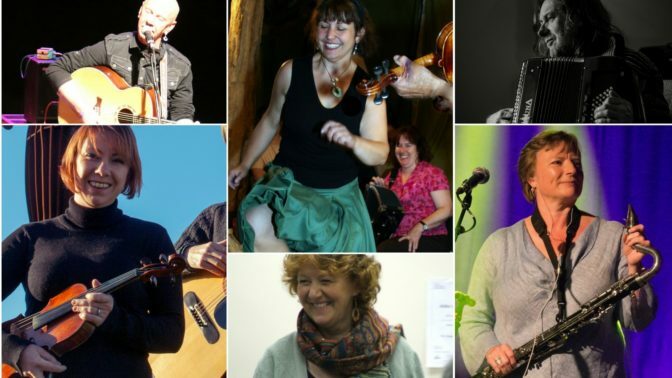 Singers, dancers and musicians (all instruments – we have dedicated fiddle, guitar and accordion tutors, and also a mixed-instrument band led by Jo) of all ages and levels of experience; there’s something for everyone! You’ll need to be able to read music if you wish to join the accordion group, but otherwise learning by ear is fine. Please let us know your preferred group when booking – but be assured, you’ll be able to move between groups should you wish! We have a fantastic team of tutors who work well together to give you the best possible experience in a mutually supportive atmosphere. Sophy Ball is a fiddle player who encompasses a huge variety of styles, performing and teaching tunes from America, Scandinavia, Eastern Europe and her native North East of England. An experienced workshop leader and teacher, she has been a co-director of the Folkworks’ Youth Summer School with Kathryn Tickell. She also performs in The Northlands with Alistair Anderson, the Andy May Trio and Bottle Bank Band with Stewart Hardy. She was a founder member of The Pack and 422, with whom she won the Young Folk Award in 1999. We’re delighted to welcome her back to Halsway for what will be her third year on the Summer School team! Kevin Dempsey is an unassuming sort of bloke, whose quiet manner and laid back attitude hide a multitude of extraordinary talents as guitarist, singer songwriter, composer, arranger and producer. His wide experience shows in his versatility and ability to turn his hand, and guitar, to many different styles and genres and, for a long time, he has been sought out by other musicians. Kev has been a mainstay of our Summer School as our guitar tutor for six years. Kerry Fletcher is a traditional dancer, performer, choreographer and teacher of many styles who works as a community folk dance artist specialising in English, European and American dance, both percussive and social. Kerry is Co-Artistic Director of Folk Dance Remixed and is passionate about both traditional dance and making folk dance relevant to today’s society. She encourages those new to folk dance to share her enthusiasm and creates new performance work inspired by the tradition. Jo Freya has been singing and playing traditional folk music since her childhood. As well as being a highly effective workshop leader and teacher in music, dance, voice and composition she is also a charismatic performer with many high profile folk artists including Blowzabella and Coope, Simpson, Fraser, Freya, Boyes in their work with author Michael Morpurgo. Paul Hutchinson studied piano and church organ before being persuaded at the age of 17 to take up the accordion and form a ceilidh band. Since then he’s become one of the best-known and in demand players on the folk scene – in the UK and beyond – as one half of duo Belshazzar’s Feast, with trio Hoover the Dog, Pagoda (with Karen Wimhurst), and PLF. Paul is a regular tutor and musician at Halsway Manor, and the accordion tutor for EFDSS at Cecil Sharp House. Carolyn Robson is one of the country’s foremost female singers and a gifted teacher. Her extensive repertoire consists of songs from her native Northumberland and Scotland and further afield. She leads three community choirs in Hampshire and regularly leads workshops.